Some of us grew up under constant correction from parents and teachers about our back posture: “sit up straight,” “shoulders back,” “stand tall;” But not me. I was corrected for bad tongue posture. I don’t mean cursing. Tongue posture has to do with where your tongue is positioned when it’s off duty from eating, speaking and kissing. Many people are not aware of where their tongue rests. You’re probably thinking, “Not aware? Isn’t it obvious? In my mouth!” But where exactly? Against your upper palate? Against your lower palate? Against your tile floor? The reason this question is so important is because the tongue is the strongest muscle in the body and it can do an astonishing amount of physical damage even while resting. I grew up with a tongue thrust problem, meaning that instead of placing my tongue on the roof of my mouth while resting it or while swallowing, I placed it against my front teeth which caused those teeth to jut forward into thirty-five thousand dollars worth of orthodontic work. The prescribed orthodontia consisted of three years of sadistic medieval torture. You may also have been subjected to this sort of violence as a child: metal brackets fused to your teeth with industrial carpet glue and wires tightened using a method modeled after the stretch rack. If the teeth weren’t shifting fast enough for the doctor to see them moving in real time, he’d band them together with teeny rubber bands. 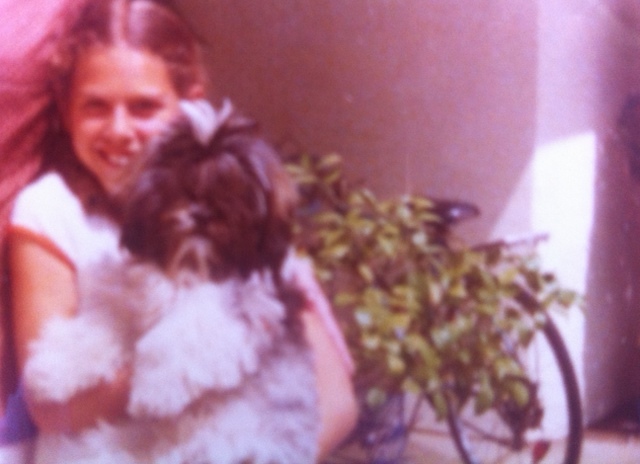 (These bands were so small, my mom used to borrow mine to give our Shih Tzu a topknot). And this was just the daytime torture. The nighttime headgear compressed your jaw with such force you thought your teeth would shatter and your eyes would pop out of their sockets. A contributing factor to my tongue thrusting was thumb sucking, a habit I had difficulty breaking until a late age, when I finally quit due to peer pressure after my friends made fun of me for driving with only one hand on the wheel. Because of my continuous tongue thrust problem, I had to learn to reposition my tongue so it rested on the roof of my mouth just behind my teeth so my palate and not my teeth would absorb the force created by my tongue (and I’m not saying that tongue in cheek). Under the guidance of Fran, my speech therapist, I practiced swallowing exercises for twenty minutes a day using my tongue to secure a pea to the roof of my mouth, and swallowing. This exercise offered tremendous results in the form of severe bloating and gaseousness caused by a cache of undigested peas the size of Argentina that collected in my stomach. Fran eventually gave up on “Mission Top Palate” and taught me instead to rest my tongue on my lower teeth (that way, over time my bottom teeth would also push forward and she and my orthodontist could run off together to a deluxe retirement Villa in Cabo). I share this story not in the name of self-humiliation, but education. My advice to readers is to be aware of where you rest your tongue when you relax and when you swallow. Habits can change due to aging, sleeping, etc., and as an adult you don’t want to reverse years of orthodontic work like I did—even if your Shih Tzu wears a topknot.